Considering how widespread batteries are, it is surprising how little the average user knows about them. Batteries power many wireless electronic devices around the world. 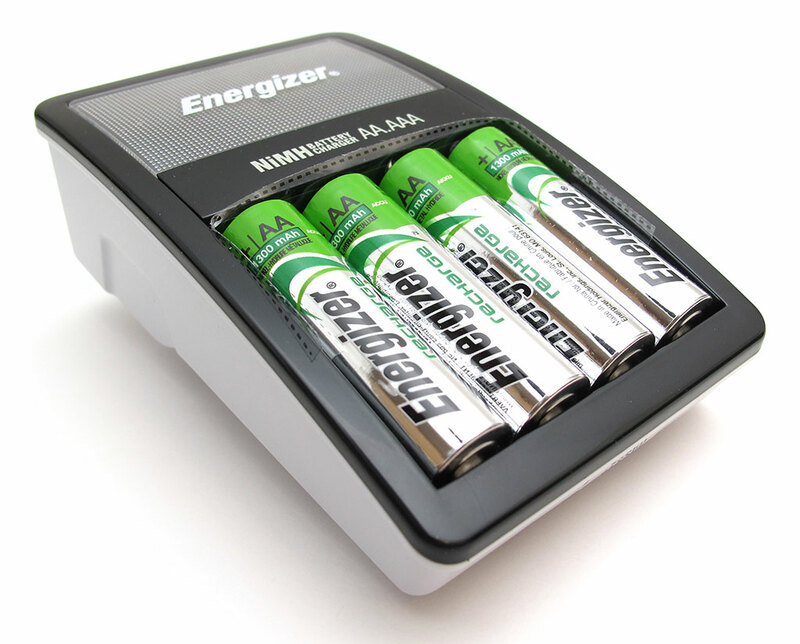 There are two general categories of batteries, disposable, or dry cell, and rechargeable. All batteries store electrical energy in chemical form. A cell is the working chemical unit within the battery. Disposable batteries use primary cells, while rechargeable batteries use secondary cells. Some batteries have more than one cell. There are three components in all cells, the positive electrode, the negative electrode, and the electrolyte. The electrolyte is either a liquid or a dry powder. The positive and negative electrodes are also known as the cathode and anode respectively. Figure 1 shows a primary cell. Electricity is the flow of electrons through a wire or any conductive path. Batteries produce electricity through multiple chemical reactions. The types of reactions depend on the type of battery. There are many varieties of batteries that contain different materials in their electrolytes and electrodes. Some examples of disposable batteries with primary cells include zinc-chloride, alkaline, and button. No matter the specific reaction, all the reactions achieve the same goal of moving ions. In a primary cell, the chemical reactions generate positive and negative ions. As you can see in figure 1, the positive ions move through the electrolyte towards the positive electrode. At the same time, the negative ions, or electrons, flow around the outside circuit. Primary cells cannot be used again because as they generate energy, they convert the original chemicals into different chemicals. Once the cell runs out of reactants, it can no longer generate electricity. Below, Figure 2 shows a secondary cell. In figure 2 you will see pink circles and arrows. Those represent the movement of electrons in the small circuit with a light bulb. This small circuit demonstrates the flow of electricity. Without the connection to the light bulb, the flow of ions does not occur. 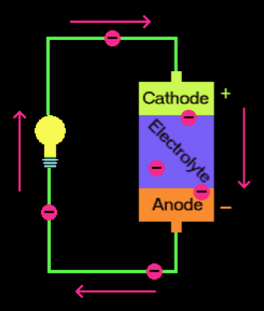 The chemical reactions within the battery cause a build up of electrons in the anode. When the battery is not being used, the electrons become very tightly packed. Electrons repel each other. They would like to go to a place with fewer electrons, like the cathode, but the only way they can do that is through some sort of outside circuit. When the electrons have the opportunity, they will move away from the anode, through the circuit to the cathode. This kind of battery is used in cellphones, computers, and cars. Running a current through them in the opposite direction recharges it. By running it in reverse, the chemical reactions are also reset. Some examples of rechargeable secondary cell batteries include nickel cadmium (NiCd), nickel metal hydride (NiMH), and lithium ion batteries. A lithium ion battery is the kind that is most commonly used in cell phones and computers. It is great what batteries enable us to do. Without batteries, we would not be able to enjoy the convenience of wireless phones, laptops and much more. However, they do take a toll on the environment. There are pros and cons to using either type of battery. For a while it was better to use disposable batteries because even though more of them went to the landfill, the chemicals in them were much less harmful than the chemicals in the rechargeable ones. However, since the creation of the nickel metal hydride battery and the advancement of the lithium ion batteries, it has become increasingly beneficial to use rechargeable batteries. Next time you are changing the batteries in your flashlight, consider using rechargeable batteries. It will not only be better for the environment, but it will also save you money!